For your lumber storage, is that screwed directly to the studs? I also like your wheeled scrap cart, I need to make one of those for my shop. I like how versatile it is with its display options! I wonder if you could also make a variant using whiteboards? That looks great, she's gonna get a ton of use out of that! Thank you! I hope my parents enjoy them! It was the first joint project I did with my Uncle, I learned a lot and we had a lot of fun! I definitely look forward to using these chairs for a long time. I find myself spending more time on my patio, just to sit in the chairs. Thanks! My mom really likes it! So glad you liked the video! Hello Tarzan the Jedi! You're right, this is a great one for a beginner, and also a really nice gift idea! Thanks so much! Nice and simple, good gift project. Hello, right back at ya! These are going to be enjoyed by so many people for years to come. We also dig the modifications you made to suit your family. Very nice. Those look super comfy, I'll have to add it to my project list. Nicely done, your modifications came out really well. WOW nice chairs. Original thinking and personal innovation for your parents. Chairs seem sturdy and very comfortable. Good job thinking outside the box. Nice work! So organized and handy! That's a great gift idea! Nice build! Hello!!! Yes, we love this one too. And thanks for the video with pro tips - that helps a lot! I really like the slots for the plastic bins! Good build! That's such an efficient use of space, thanks for sharing. This is such a purposeful design, nice work. Hello, Tarzan the Jedi!!! Thanks for another great project video! One question, is that a large banana or a small banana? :) Love it! Really like adding the french cleats to the edge of the workbench! 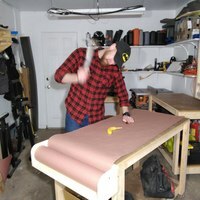 Thanks for the tips, I'll have to check out hardboard for my benches. That looks amazing, great work. Thank you! I'm really happy with these tables! I love the custom shelves, and the stain turned out really well. Thank you! It was a fun project to design and build!